MainAll NewsMusic & EntertainmentCan Rap Music be Jewish? Can Rap Music be Jewish? Yitz "Y-Love" Jordan talks about his tour in Israel, his journey to Judaism and kosher hip-hop. Jewish hip-hop artist Yitz "Y-Love" Jordan recently returned to Israel for a series of concerts over the Sukkot holiday. He spoke with Israel National News about his new projects, his journey to Judaism and why hip-hop can invigorate Jewish youth. Y-Love performed at a variety of shows during his stay in Israel, including the Beit Shemesh Music Festival, the RockAmi Festival in Jerusalem, and the UnitY-Love concert to help raise money for the Jaffa Institute. 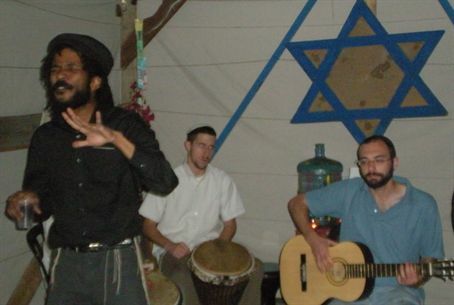 He also performed at a downtown Jerusalem dance club and made an appearance at the NachlaOr sukkah in Jerusalem. Jordan's CD releases include This is Babylon and an all accapella album called Count It - Sefia. He plans to release a new CD in the coming months entitled This Is Unity which he hopes will be marketed in mainstream outlets. Born to non-Jewish parents in the United States, Jordan converted and came to Israel to study in Ohr Somayach yeshiva in Jerusalem. It was there that he first came upon the idea of rapping Jewish rhymes. His chevrusa (study partner) starting reciting versus from the Gemara to a beat. "We weren't really connecting to it," says Jordan of his initial attempts at learning the Talmud. But the novel approach made the lesson stick. "We went from the intermediate program to the Beis Medrash program within a short period of time" Jordan says. Not everyone at the yeshiva was a rap fan, however, "People would say its a goyishe (non Jewish, ed.) style of music, Jordan comments, "but ten years later, we still remember the sugiyah (Talmudic exposition, ed.) ." As far as his conversion, Jordan says that he was interested in Judaism from childhood. He remembers the local TV station airing a Happy Passover promo. This brief encounter prompted him to draw Jewish stars around the house. "I started wearing a kippah and tzitzit (skullcap and prayer shawl) at age 14." states Jordan. He began his conversion process in Brooklyn, New York. When the rabbi asked him is there was anything he could say that would turn him away, Jordan answered "not really, because I already know where the Seforim (Jewish book) store is now." The only other member of his family to take a in interest in the Jewish religious was his Puerto Rican grandmother, who bought him a menorah and chumash, as he progressed in his learning. As far as his former non-Jewish acquaintances, Jordan states, "my friends who I grew up with are still my friends now." The music of Y-Love has taken on some unexpected fans. "I never know who my target market is," Jordan says, "I never know where its going to hit." Jordan describes a concert in which a group of "thugged-out gangster-looking guys" came in. "I thought they'll hate me and make fun of me," Jordan reminisces, but as soon as he started rhyming, and specifically when he got to the versus in Aramaic, they started cheering. Jordan praises Israel and is considering a permanent move to the country. "Here in Jerusalem I am way bigger than in New York, with all the yeshiva kids. They want to listen to hip-hop in general, but I'm the only hip-hop that the rabbis will let them listen to," states the musician. "One guy told me that he made a playlist of me and a couple other artists and this convinced him to make aliyah." Jordan says this incident alone convinces him that he is making music for the right reasons.